What does your family do for Easter? What traditions are you creating that your babies will carry with them as they continue to grow and one day fly off to create a nest of their own? When it comes to the holidays, especially today given that they are entirely seeped in consumerism and keep getting bigger every year, Andrew and I prefer to keep things simple. Not that we don’t want our kids to grow up without experiencing the joy of each holiday, but more so that we want them to take away simple treasures each holiday carries, rather than only appreciating the new round of gifts to open. Which is why I am making the kid’s Easter basket goodies, and plan to do so from here on out. Just as we all work at our own pace and rhythm, we all have different things that calm and soothe us depending on our personality. For me, making things with my hands is more than a means to an end. Yes, it’s great that whatever I end up making was done with care and is handmade, but making things by hand offers me more than economy and conscious homemaking, it also offers me a change in my tempo and nourishing presence. Because when I take the time to make something, such as these cardboard lace up cards, the energy of my mind syncs with the rhythm of my body, and I become one, rooted in the present moment. The same thing happens when I cook, hang laundry on the line, dig in the garden, read a good book, and take part in other simple hands on pursuits. It is in doing things by hand that I feel most alive, most aware, and most myself. While I do use the quick clicks of Amazon, I believe that our culture is too quick to buy things on a whim, when really all that is needed to create a bit of joy for a holiday is a pinch of time and tender use of one’s hands. And if you enjoy reading about the beauty of handwork, you might really like this post from a few years back. So when I can make it, I try. Not always, but most of the time. And with regard to this Easter and in pondering what we should get and do for the kids and our family, it was clear to me that most of the things I wanted to buy could be made. Plant-dyed play silks as Easter grass, some homemade goo or essential oil play dough stored in a mason jar in their favorite color, a braided necklace, pressed flower pendants, and other simple but meaningful gifts that show not only the beauty of this spring holiday, but the intentionality that their mom and dad folded into each basket. 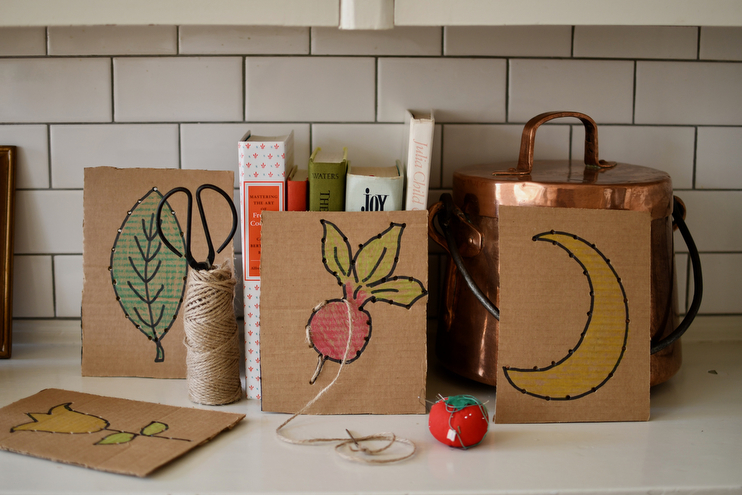 Step One | To make these cards, you’ll need to dig around in your recycling bin to source several flat, plain pieces of cardboard. Using a very sharp scissors (or a knife) carefully cut the cardboard into the same size rectangles or squares. 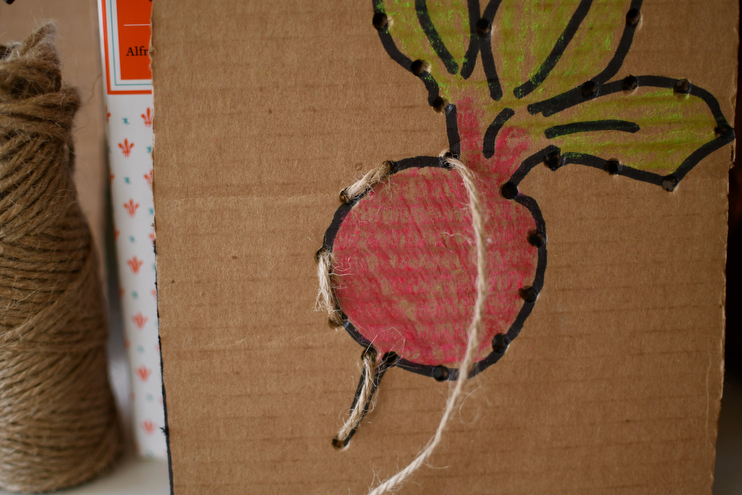 Step Two | Next, use a sharpie to draw a simple design on the front of the cardboard, keeping in mind that round objects are going to require a few more holes than ones with straight edges. You can get creative here and draw things your kiddos like, such as tools, animals, or things from the season or nature. Step Three | Using a screwdriver, poke holes along the lines of the object, spacing them evenly but accurately, so when the card is threaded, it keeps the shape. 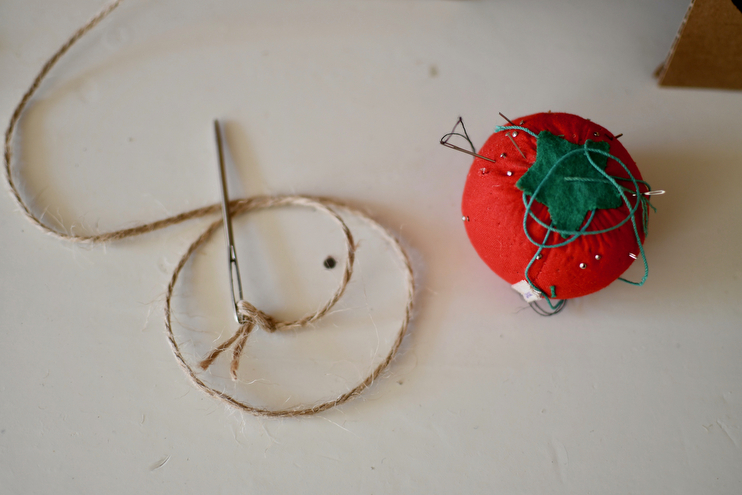 Step Four | Color the objects, cut a long piece of twine or yard, and tie it to the needle. You’re done! These lacing cards would be a great car ride craft, in addition to helping develop fine motor skills. Are you going to be making any of your kid’s Easter basket goodies this year? If so, so share! Happy crafting!